March 26, 2019 – Not sure who started this celebration, or why it’s not National Hot Tub Day every day, but March 28th is the day on the calendar set aside to celebrate this all-American invention we love so much! The hot tub has evolved a lot since the days of the round wood tubs that were built back in the ‘70’s. During the heyday of those barrels, Alice & Blair—our co-founders—decided it was time for them to make a splash in the hot tub business and open Olympic Hot Tub in 1977. Blair came up with a great design for a cedar hot tub and engineered them so well that many of them survived well into the 2000’s! Each was emblazoned with a cool bronze plaque that Alice dreamt up. You absolutely knew when you immersed yourself into one of those oldie-but-goodies that it was an Olympic Hot Tub. Today, 5.8 million hot tubs are in backyards, hotels and gyms around the USA. As you can imagine, we don’t think that’s even close to enough, given the amazing health benefits of hot water soaking! With studies that prove hot water immersion helps with arthritis, Type 2 Diabetes, fibromyalgia, back pain relief, better sleep, injury recovery…that’s just the start! The ability of a hot tub to bring friends and families together is a priceless added benefit as well. So, how will you celebrate National Hot Tub Day? Here are some ideas. Have a hot tub party. Invite friends over to enjoy a nice meal and then retreat to the hot tub for a terrific soak. 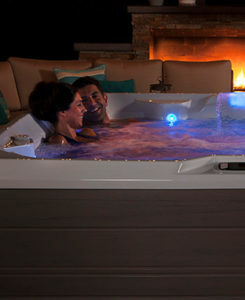 Make a hot tub date. Has your busy day-to-day life cut down on time with a loved one? Text them (or better yet, write a handwritten note!) and set a date that includes hot tub time to help you re-connect. Treat co-workers to a rubber duck. Head to a toy store and pick up some rubber ducks and surprise your co-workers when they come in with a happy yellow companion greeting them at their work station. Rubber ducks are always a hit! Our showrooms have a selection of rubber ducks ready to bundle up and take to your workplace, too. Buy a gift for you hot tub (that you’ll love too!). Hey—don’t leave your hot tub out of the gift giving, especially since it does so much to keep you feeling great. Maybe your tub is in sore need of a new cover? A fresh set of steps? If it’s a Hot Spring Spa, maybe you can give yourself the gift of music with a Bluetooth Music System. Or maybe some shatter-proof drinkware to enjoy your favorite refreshing beverages while you soak. We’ve got a terrific array of goodies for your tub on our E-Store. Don’t have a tub of your own yet? Make National Hot Tub Day the day your finally get one for yourself! If you’re in our service area and ready, it’s never been a better time to buy. Hot Spring’s Hot Tub Finance Event is on right now, and on approved credit you could buy your new tub and have five years to pay for it interest free! It ends April 1st, so be sure to take advantage of this terrific promotion. We’ve got the most terrific array of Hot Spring Spas that are better than ever—and all feature FreshWater Salt Systems for healthy salt water soaking every night! Have a terrific National Hot Tub Day!